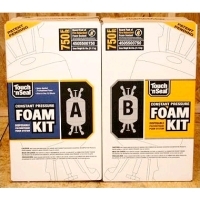 Promotion: With purchase of CPDS Series 2 Machine and one 750 Foam Kit Get a Free High Expansion 750 Foam Kit. Add the PROMO to your cart and save $795! This polyurethane foam is for use SPECIFICALLY with the CPDS Series 2 Machine, and cannot be used without it. Allows for down-sized HVAC systems; uses less energy, fewer cycle times, more consistent “comfort level”, reduces equipment maintenance. Note:To dispense foam, you will need a gun/hose kit which is not included. Note** This item cannot be returned and no credits can be issued; *NOTE: This item can only be used with the CPDS machine. ADDITIONAL INFORMATION: This item is non returnable and no credits can be issued. Also, due to the chemical nature of this product, this item cannot ship outside of the 48 contiguous US states.